I saw a piece on Good Morning America today about a neurosurgeon who just completed a book about his near-death experience. This is a BRAIN scientist (and not really a practicing Christian) describing incredible details about an experience that occurred during a seven-day coma where he had no brain function whatsoever. 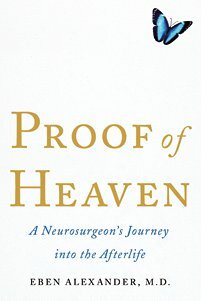 Like Dr. Alexander, I, too, was a skeptic about heaven and afterlife. Until my dad died. Now, that’s probably completely natural… we skeptics are so overcome with grief and sadness over the loss that we simply have to believe that our loved ones go on to someplace better. I sat at my father’s hospital bed while he was unconscious that last day, hoping (and maybe even praying) that this was true. There were two signs in ICU that night that convinced me it was: A female doctor, who had seen him once or twice before, was working that night and came into his room wearing a long-sleeved shirt with an angel embroidered on it. She was gentle and sympathetic, and I will never forget those angel wings on her shirt. When I asked my mom if she remembered that weeks later, she did not. The second sign occurred when my husband said good-bye to my father. He was leaving to take care of our children and went to Dad to tell him he loved him and that he’d see him in 50 years. My Dad flinched. I just know he heard us and that was his way of showing it. I’m sure he’ll be waiting for us—to give us a tour around, just like I know his mother, who died when he was just six years old, was waiting for him. The passing was just that… a passing from one level of consciousness to another. And at that moment I felt peace. Oh, I just bought this book today! I heard Dr. Alexander speak last spring, and the entire overflowing room was enraptured. Thank you for bringing this to the forefront. My favorite part was when he was riding on the butterfly and his guide said, “You are perfect. You can never do anything wrong.” So the butterfly on the cover is especially sweet. I agree, his story has me enraptured as well and I also plan on buying the book! I also read “Heaven is for Real” by the minister’s son who had a similar experience as a small child. Much food for thought!